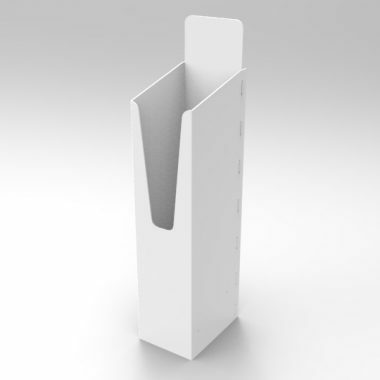 Double A5 Brochure Foam PVC Dump Bins. Dump Bins magazine newspaper bulk dispensing. Did you know GJ Plastics designed and manufactured our very first dump bins magazine newspaper for bulk dispensing in 1993. We have made and delivered many thousands throughout the world to newspaper and magazine publishers and event organisers? We are a leading designer and producer of bulk dispensing dump bins. 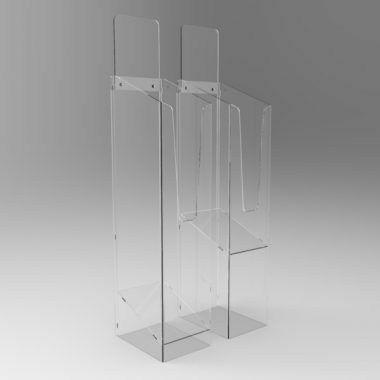 Our product designers not only ensure that the displays look good but that they will enhance your magazine or newspapers. When we have designed the dump bin and determined what materials we are going to make it from. The next stage is to produce a prototype and test it to ensure it performs to our required product standards. Once these trials are complete and we are satisfied with the product we then and only then sell it to you our highly valued customer. All orders are then produced in our UK factory allowing us to maintain and control quality standards. 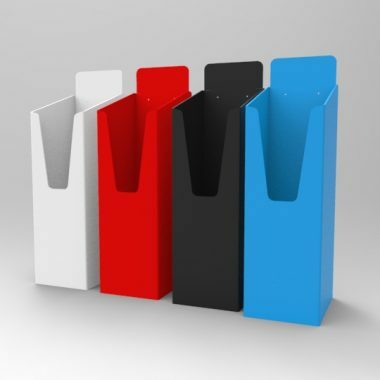 Magazine and newspaper dump bins are made in a variety of materials and are the ideal solution for bulk dispensing. 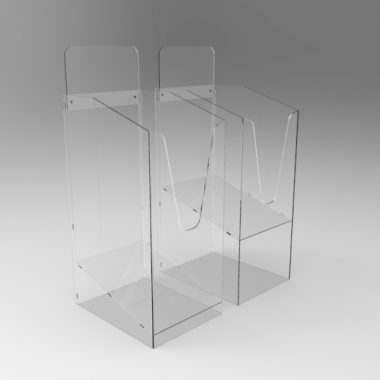 GJ Plastics Ltd makes acrylic dump bins in A5, A4 and tabloid newspaper sizes. We use high impact acrylic this is far more durable and stronger than standard acrylic. 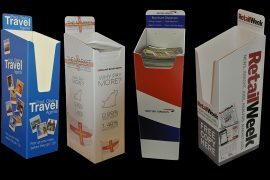 Manufactured in 5mm thick foamex for durability, they are hugely popular with companies who require a stylish bulk dispenser. The foamex magazine and newspaper dump bins if you choose can be direct printed with UV stable inks. 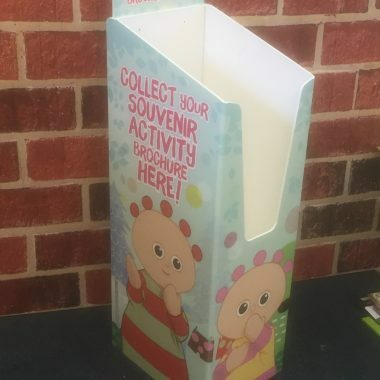 This is a stunning way of getting your promotions or image across in the market place. The Tough Bulk dump bins. 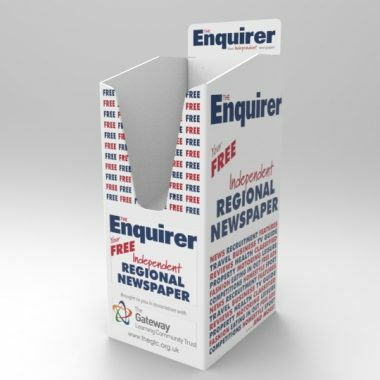 Polypropylene magazine, newspaper dump bins are very durable, long lasting and almost impervious to damage. They can be easily wiped down and branded if required by using vinyl stickers. These bulk dispensers are probably the toughest on the market. Correx Dump bin magazine and newspaper sizes. 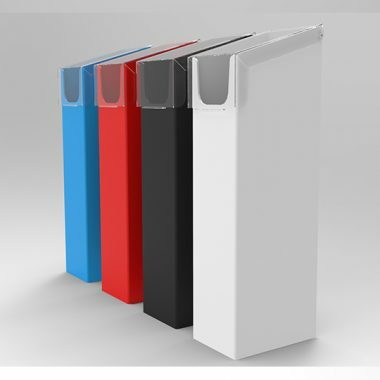 GJ Plastics have developed a unique load bearing bulk dispensing dump bin in Correx that can be flat packed. All our branding produced in our commercial print department. You can have your branding directly printed with waterproof UV inks. 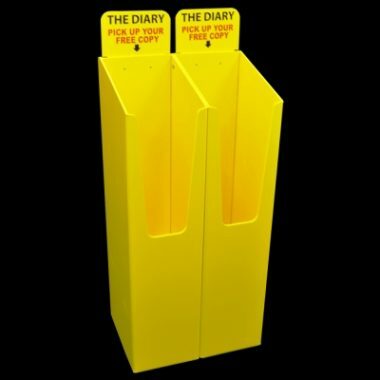 We are of the opinion that these correx Dump bins are stronger than the 3mm thick foam PVC dispensers sold elsewhere. We do not consider 3mm foamex will stand up to the rigours of bulk dispensing. 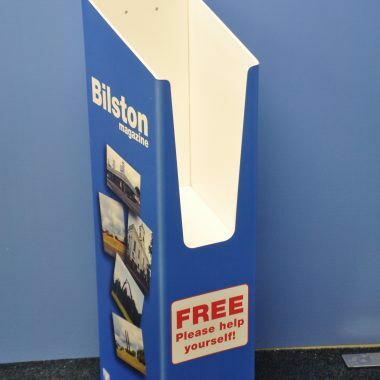 All our dump bins offer fantastic value plain or printed or options available for each type. 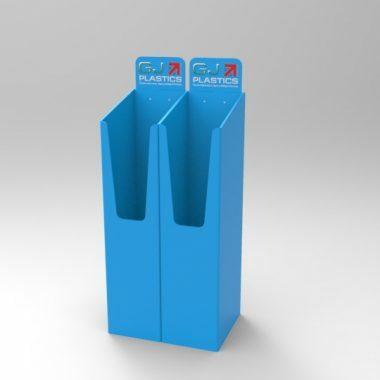 GJ Plastics dump bins are all designed and produced in the United Kingdom and sold throughout the world. The dump bins we created for magazine and newspapers have been manufactured and dispatched throughout the world over the last 25 years. 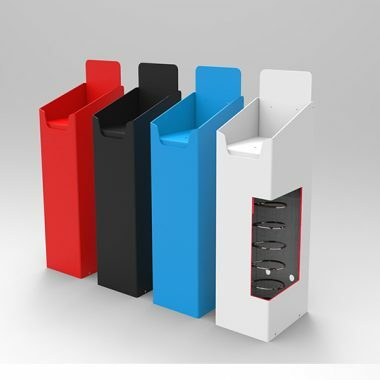 Looking after your Dump bins magazine newspaper bulk dispensers. Indeed we recently visited a major exhibition centre, and in the main foyer our dump bins was in use. This particular design was made over 15 years ago, still looked great and filled up with magazines to promote the venue. A variety of styles and materials, Hi impact Acrylic, Foamex, Polypropylene, Perspex and PETG. Static and spring loaded, sloping shelves and flat shelf plinths. Mobile Dump bins with wheels. Branding on all products can provided at additional charge. We can also custom design a dump bin to suit you. 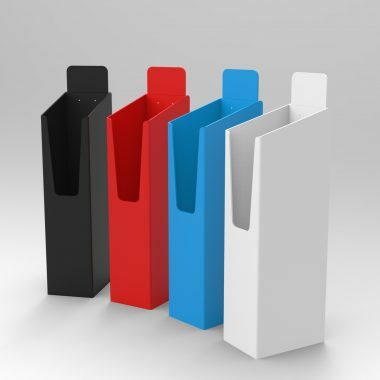 So if you need any Dump bins magazine newspaper bulk dispensers why not give the original designer of these products a call on 0161 723 1374 and talk to one of our experts in bulk dispensing.